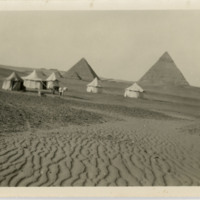 Photo of an unidentified pyramid field with 5 tents and what appears to be a horse-drawn cart. This is from M. Carey Thomas' trip to Egypt in 1929. 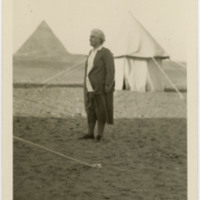 Photo of M. Carey Thomas standing in the desert camp in an unidentified Pyramid Field.